his beautiful variegated form of Tulbaghia will appeal to many gardeners for a number of reasons. The narrow strap-like leaves are a lovely blue-grey colour striped with cream down their whole length. 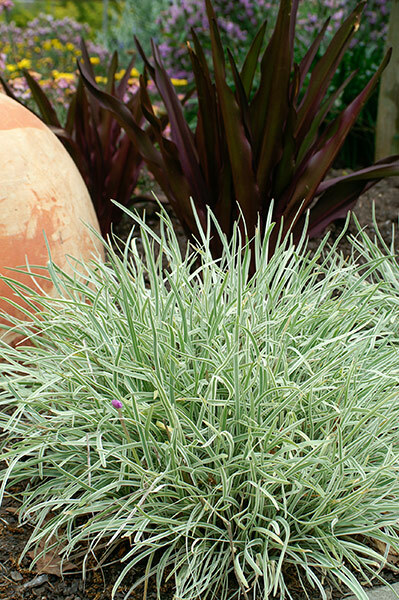 This attractive foliage forms a silvery mound to around 30cm in height. During sping and summer slender stems rising to around 60cm bear loose umbels of dainty lilac-pink flowers which resemble miniature agapanthus flowers. In milder climates spot flowering will continue on through winter. Native to South Africa this hardy plant is drought tolerant with the ability to recede into its perennial bulbs during times of prolonged dryness re-emerging when conditions become more favourable. 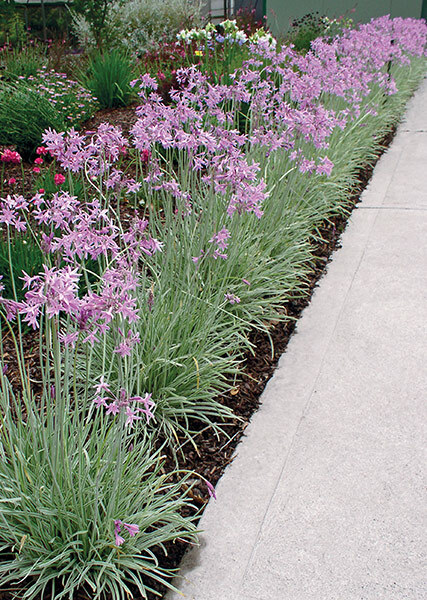 'Silver Lace' emits a garlic odour which serves as a useful pest repellent plant to grow beneath roses or as a companion plant in vegetable or herb gardens. Use at the front of a sunny garden border or in cottage and herb gardens. 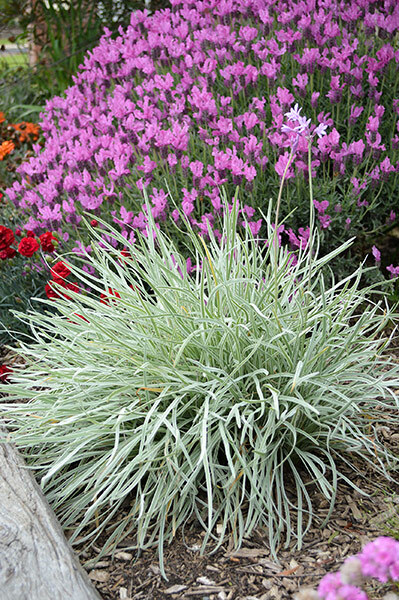 The silvery foliage is attractive when used in rockeries also. 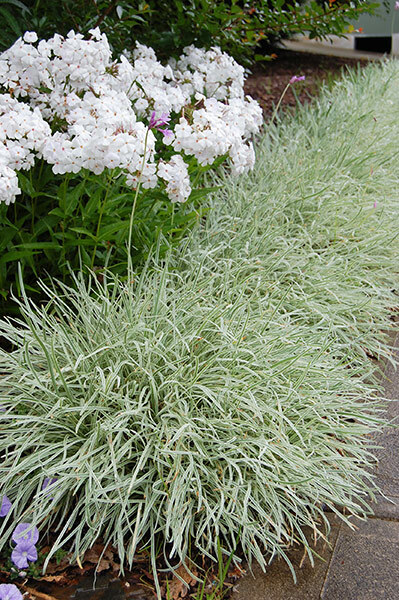 Wonderful accent plant which is particularly effective when used as a contrast to other dark green foliage plants. Can be a dainty and benefical companion plant for the vegetable patch. Select a warm, sunny site in a free draining soil. Water plentifully when the foliage is in active growth then reduce as flower spikes emerge. In very cold areas water freely again just prior to bulbs entering dormancy. Tolerant of temperatures to -10°C. Some protection may be required in areas where heavy prolonged frosts occur. Also drought tolerant although mulching and the occasional deep watering during extended dry periods will increase overall plant performance. No pruning is required - simply remove spent flower heads to encourage further flowering and to keep a neat appearance. Use a slow release fertiliser during spring.